His business was the cleaning of the city’s and the company was making a special programme and effort to clean the street of Ibiza for better tourism and make it nice. The thing they say on everything was “Ibiza, a garden in the sea”. That was his company. He pays me for the season and that year I make my best results ever and I make more money, this was the year I was riding for free and it’s the year that I make the most money ha ha. Did he have any other sponsors? Gasgas pay me for the trips but I have no money for me just the 1st year, the 2nd year I have contract. 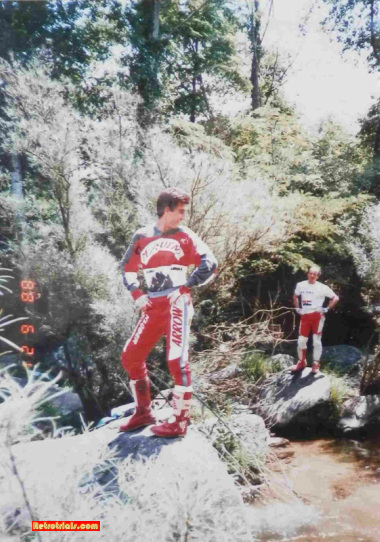 The first year Gabino was there and actually we have good relationship and we start to develop the bike. 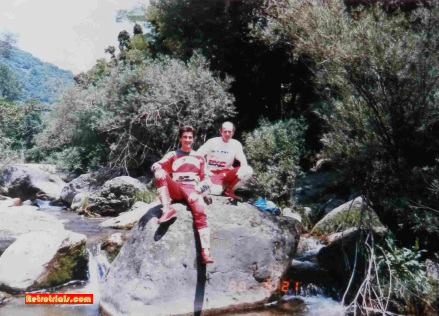 Gasgas was an amazing company because Pibernat and Narcis were you and Paxau was really smart on the engines. The Halley was a very nice bike to ride. The best engine of the moment for sure. Was this the Hiro engine? But doesn’t this engine desend from the Hiro engine? The early Halley didn’t have the villa yet. My 1986 Halley says Villa on the engine? 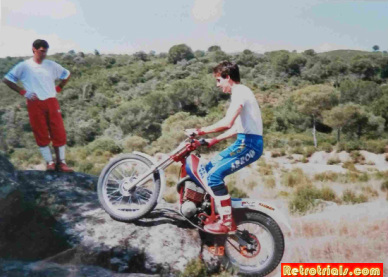 You have one of the very early ones but after bike number 30 they all had engines made by Gasgas themselves because Villa cannot supply so Pibernat copy the engine. Did Gasgas go to Italy and buy the moulds? No, they just make themselves. The new engine was a little different to this. I think that when Villa finished they transfer the making to Spain. Did you ever go to the Villa factory in Italy? No, I never meet Fransisco Villa. Frames were made in Spain. 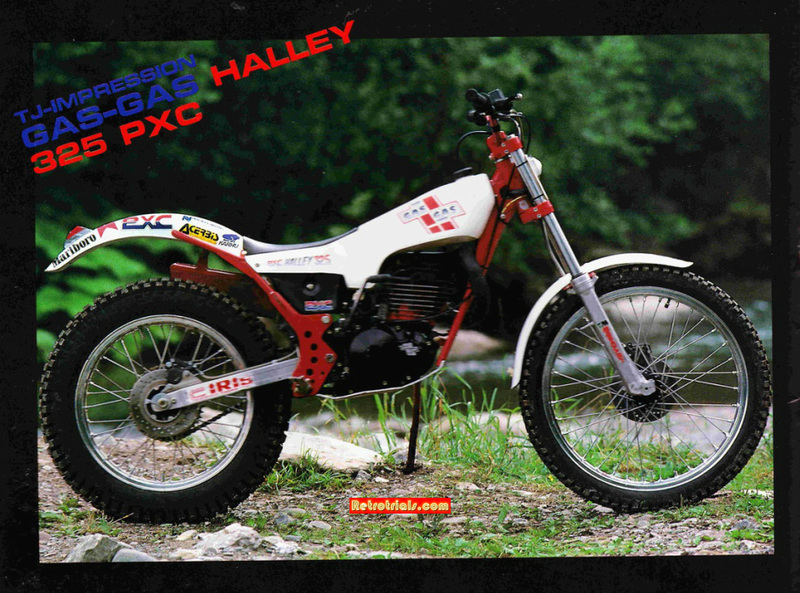 Did you have an opportunity to ride the Gasgas Halley before your first year with them? Yes for sure. I know Gabino and I ride his Halley. 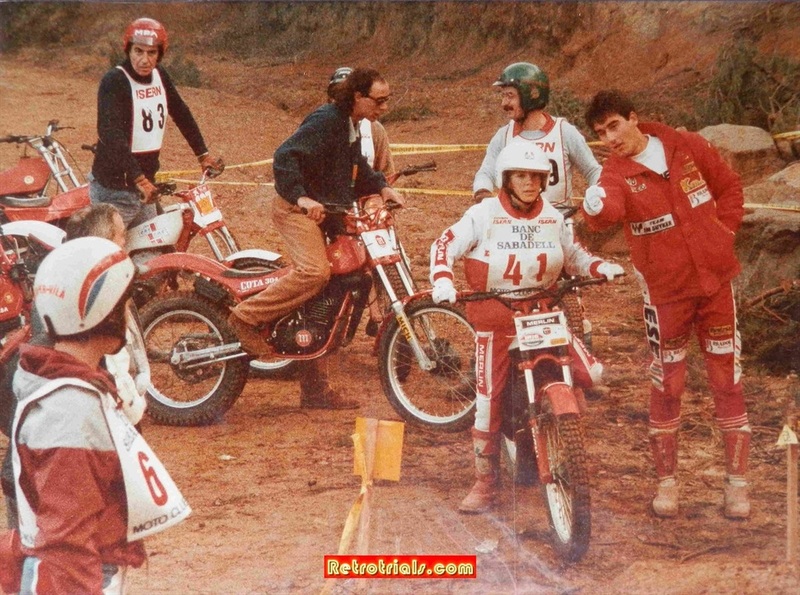 Gaby never ride trialsin. 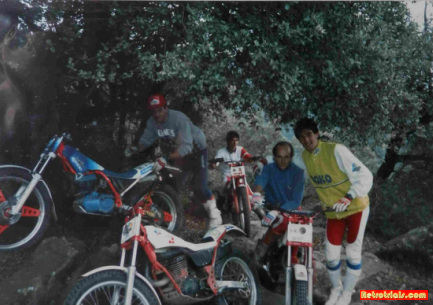 Jordi, Gabino, Joan Friexas, Ronald Garcia, Gallach, a lot with Lluis, a lot of practise with Lluis. We were practising almost every day. What is Ronald Garcia doing these days? 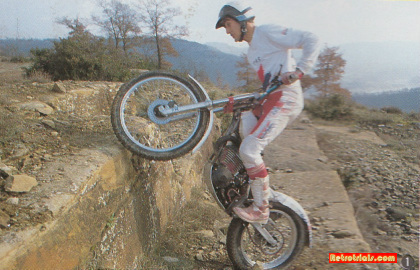 He has a machines company in Barcelona and I think he is still doing this, he was one of the riders of Mecatecno. 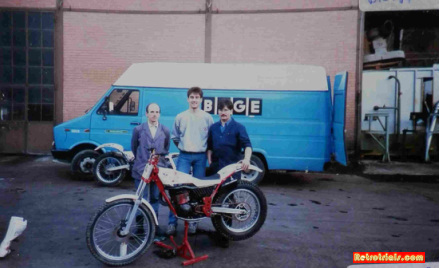 When you started with Gasgas in 1987 how did you help to develop the Halley? I have very good relations with Paxau. He is one of my best friends, Paxau. We are still very close and we understand each other very well and I think myself and Paxau have the same feeling and the same vision of what a trials engine has to do, so we understand each other very well. We have done a lot a lot of practise with Paxau with very very little budget and facilities. Everything was very much thinking through problems. There was very little money to make things, we had to get it right first time. Paxau was very good with the engines and very good with the chassis, good with everything? Paxau is good with the chassis but not with the rear suspension. He has a hard time with the monoshock. When you started to work with Gasgas, where were they based? In the middle of Salt, in a small place. 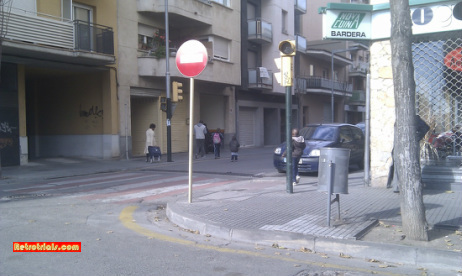 I work there with Narcis and Pibernat and Dani Font and it was just a small home like this where the Gasgas were built. 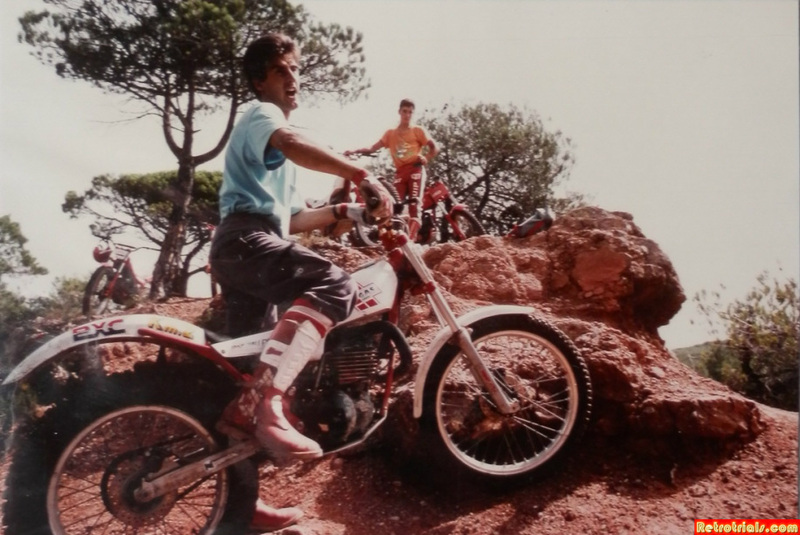 Here you can see the late Dani Font standing outside of the first GasGas shop. 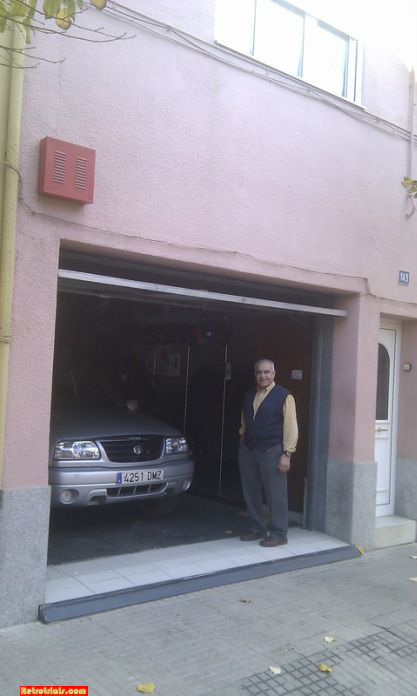 Dani Font used to be the landlord and lived in the flat above with his wife . 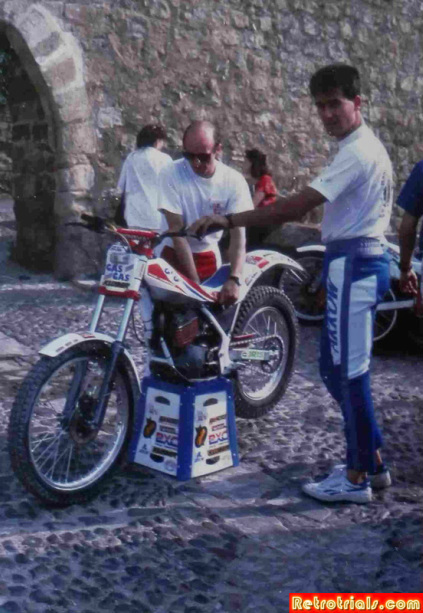 Dani was a very loyal GasGas man and when i spoke with him you could see that he was very proud to have been involved. 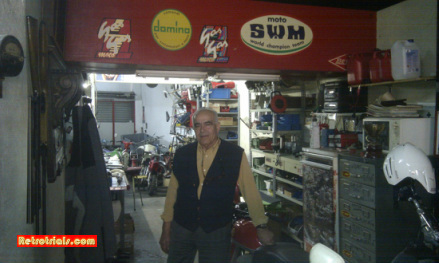 I went to this old GasGas shop and it had been left by Dani completely untouched ,GasGas paperwork was still in the small office and old original logo GasGas coats were still hanging up.I took lots of photos and compiled a report .Ill post a link up at the end of this interview. The above left picture shows the glazed end of the shop. Narcis (left),Pibernat(right) ,SWM founder central. Did they build the chassis in that room or just the engine? No, everything comes from the outside and they just assemble, just like now. Gasgas was a subsidy of remote. Remote was a distribution company from Narcis and Piber. They sell acerbis and ariete and other manufactures and were distributors ( wholesalers). 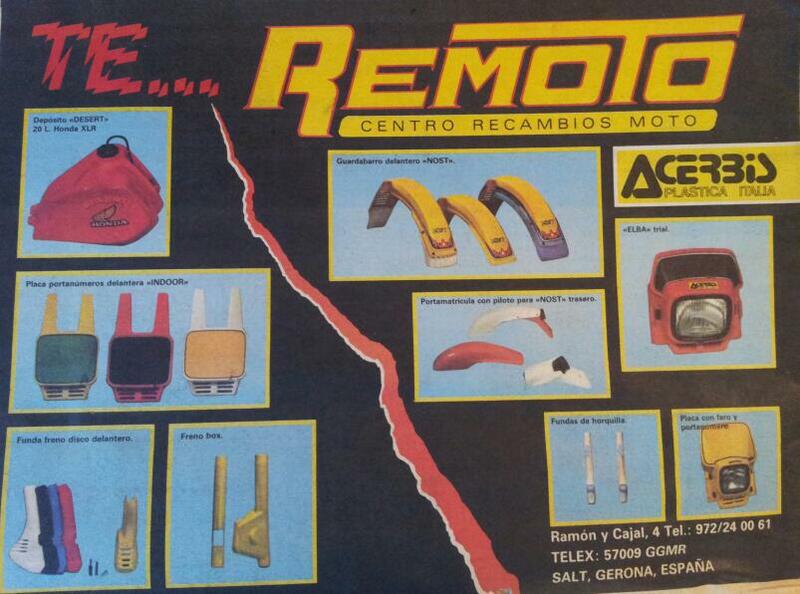 What year did Remoto start? In the late 1970’s. They make a lot of money and they invest in the bike and they run it alongside SWM and when SWM finish they decide to build their own bike. 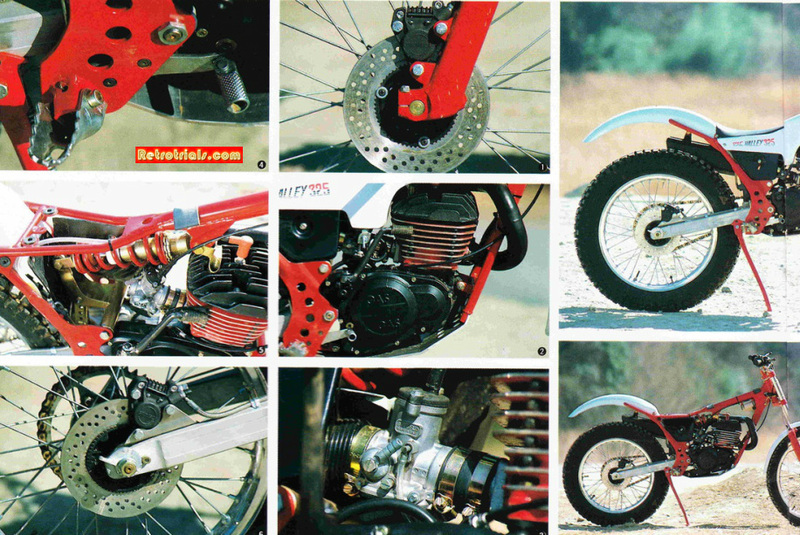 Remoto was the distributor for SWM and Bultaco. Did they have any other premises at this time? They just have a little warehouse in the middle of the town that was about 300 square metres. They have also the distribution and all of the Gasgas there. I still remember the little office of Narcis. The little office of Narcis was from here to the television (12 feet) square. This was not the Dani Font place, the other place I say. Did Dani Font own the shop and was he the landlord? I don’t know. 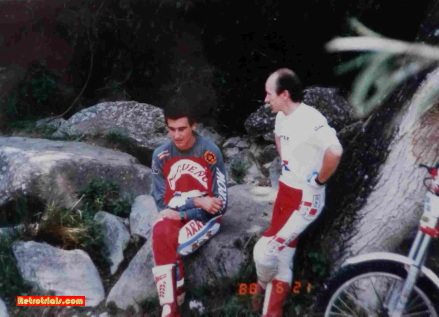 I think Dani was a good friend of Piber and he was the mechanic of them. How did you meet Josep Pibernat and Narcis Casas? 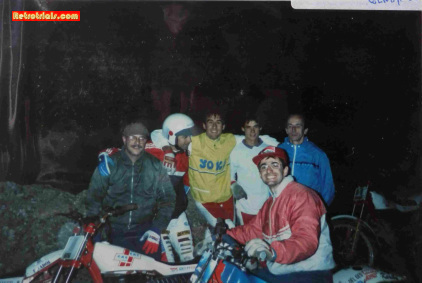 They were riders so we meet, the racing community was very close. 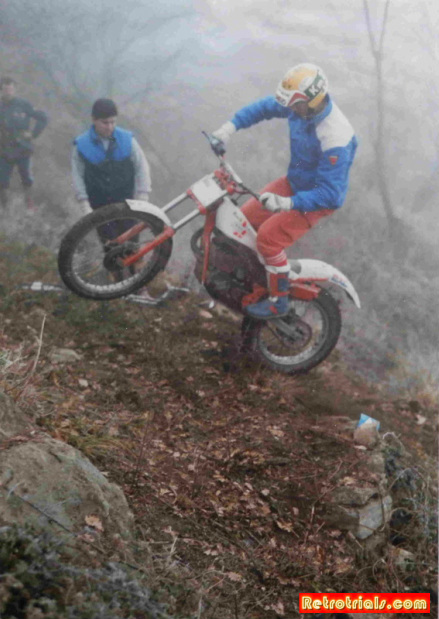 They were enduro but trials and enduro is very close and we all meet and talk. 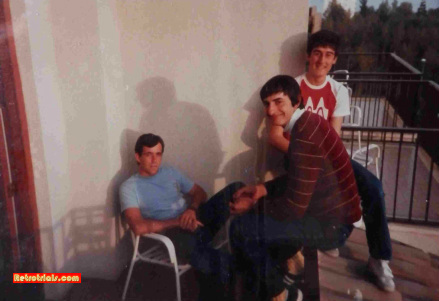 Over the years did you grow to be good friend with Narcis and Piber or was it just business? With Narcis and Piber I learn a lot of things but I learn a lot of what not to do. So first thing I have to say about Narcis and Pibernat is that they are very different persons. You cannot believe that they could be partner because they are such a different type of persons. Piber was able to find anything you couldn’t find and was able to make everything faster than anyone else. 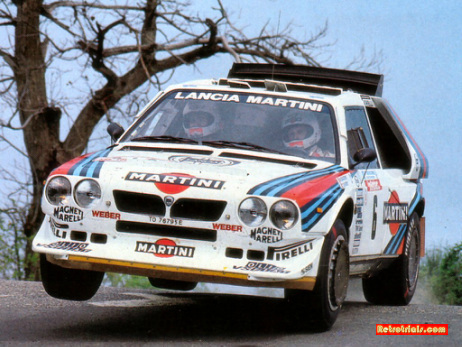 I remember Piber, they had to build 6 Gasgas, he has a Lancia Intergralia and he has no filter boxes for the Gasgas Halley that we have built on the Wednesday afternoon. He takes the car at 6 o’clock and he take to Milan and he get 6 filters and at 7’oclock in the morning he was in Girona again. He goes to Milan and back just to get 6 air filters to build 6 bikes. It is 900 kilometers from Girona to Milan so he make 1800 kilometers in 10 hours so 200 km +.